Grilled Balsamic-Glazed Veal Chops, Thyme for Cooking gourmet summer. Simplicity is often best. A light glaze of Balsamic Vinegar gives these chops a bit of color and a hint of flavor. Mix olive oil and vinegar well with whisk. 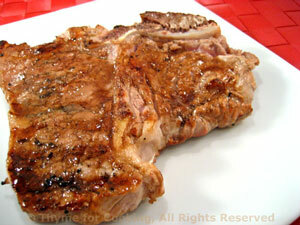 Spoon on both sides of chops and set aside for 10 - 20 minutes. depending on how thick and how done you want them or broil 12 - 15 minutes. Take a peak to see how done they are.